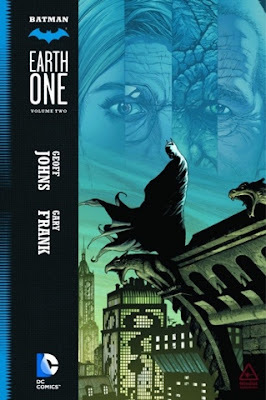 I reviewed Batman Earth One Volume 1 back in September of 2015. The exact same creative team that did that book is on Volume 2. Career DC comics scribe, Geoff Johns, writes, and career DC comics illustrator, Gary Franks, draws with assistance on inks by Jon Sibal and colors by Brad Anderson. I assumed that since this team did all the heavy lifting in the first trade by reintroducing and retelling an already over done origin that this graphic novel would have an easy job to do. Unfortunately that wasn't the case as they had a lot to live up to and obviously tried to outdo. 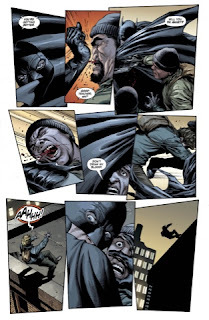 Batman Earth One Volume 2 starts off a lot like Volume 1, with Batman fighting thugs, only this time he doesn't look like as much of an amateur. He's facing off against multiple guys instead of one, it went from a knife fight to a gun fight, and now he has a clear purpose. Alfred is on comms as usual but more as a master criticizing and critiquing a student. Bruce narrow escapes death as multiple bullets blaze through his cape. "Killer Croc" is mentioned, Maroni & DA Harvey Dent are in court, Gordon confronts Bullock about his new situation, and somebody is wreaking havoc with riddles. An old friend, Jessica Dent, Harvey's sister, now the mayor, gives Bruce a visit and proposal. There's still four corrupt heads high up in different branches of government keeping the establishment of Oswald Cobblepot's old regime. 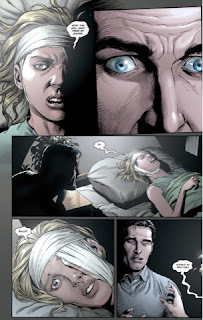 Jessica & Harvey Dent mean to find them and get rid of them but they need some help. By the end it turns out someone has conveniently done that for them. 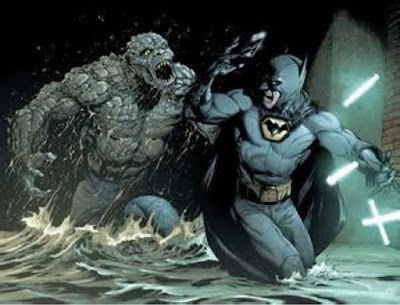 Along the way Batman has a confrontation with Croc and Bruce does something he never has before. This comic book tends to do things no others have but sometimes it works and sometimes it doesn't. 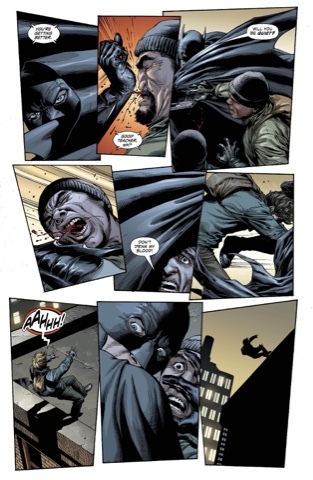 The art in Batman Earth One Volume 2 doesn't do much different from Volume 1. 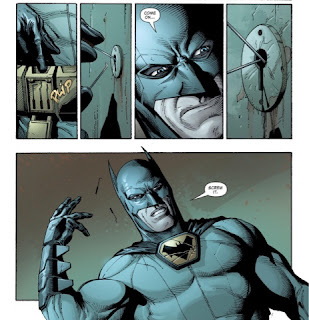 Much like the rest of Batman Earth One most of the art is steeped in reality as well. Batman doesn't have a ridiculous looking "Batmobile," just a car. Killer Croc doesn't look too over the top. The art in this book is quite subtle. It's absolutely brilliant for the most part. The paneling is well structured, deeply thought out, and extremely intelligent. I thoroughly enjoy how detailed, expressive, emotional, and realistic this art can be. The colors have an overall darker tone that flows with this story even more so than the previous volume. When it departs from that dark, gritty, and realistic look is when the art falters. I feel like this book tries too hard to do something different. Geoff Johns changed a lot of the characters, their attitudes, roles, and personalities yet kept certain things the same. Harvey Dent is the DA with a temper again so you have to assume that he's going to become Two-Face at some point. Instead of going the obvious way, Geoff Johns makes Two-Face into something that not only seems like a stretch but it doesn't make much sense either. As steeped in reality as this iteration of Batman is I just couldn't buy into some of the crazy things that were in this book. I would have preferred to have Croc and Riddler appear as consistently real as the rest of the series. Somehow Johns managed to make the most interesting and likeable character from Volume 1 into a completely different, unlikable disaster, Bullock. Hard charging, self righteous, former Hollywood reality star Detective Harvey Bullock was transformed into an alcoholic, deadbeat, loser. The implementation was crap and the explanation was even worse. Right away the main villain of this book is introduced. It was quite obvious even though they didn't actually reveal him until the end. When they finally did it was a huge letdown. I get that Gary Frank may want to look and be different but at a certain point when it's too much of a departure it not only doesn't fit it just seems stupid. When they make it more realistic it seems to work but when they depart just to separate it from other iterations it just comes off as unnecessarily too much. For example, Bruce has purpose in this book but his direction and skills aren't that well developed. Instead of saying that he's a man in his twenties that has been traveling the world mastering different arts from different masters, which is kind of ridiculous, they have Batman saying I'm not a detective, that's Gordon's job, I just beat guys up that need it. 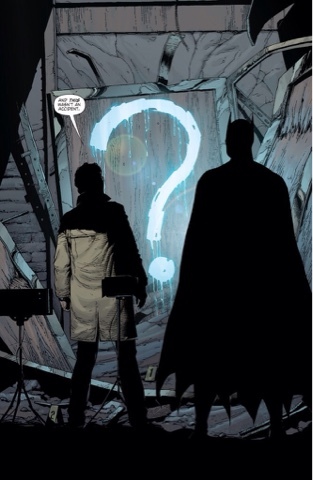 As the story goes on Bruce realizes that learning detective skills would be useful so he asks Gordon to teach him forensics and such. As exciting as it sounds to learn detective skills from the greatest ex-Interpol detective agent in the world it just doesn't seem feasible, whereas learning from the hometown detective you trust most does. This may take away from Batman's cool factor, but if you think of him as a crazy guy who dresses up as a bat in grey pajajay's with a cape and cowl, that doesn't sound all that cool either, so you kind of have to put things into perspective. Because Johns was going for such a realistic and authentic feel when this book starts getting away from that whether it be story or visuals it makes it that much harder to buy into it. Reality works with reality and ridiculous works with ridiculous but they don't work well together. All in all I didn't buy into it this time. There's a lot of good things about Batman Earth One Volume 2 but they don't overcome the ridiculous aspects of its realistic tone. The departures in art and story ruin it. The characterizations from Volume 1 characters were off and didn't make sense most of the time. The story seemed forced, felt rushed, and too convenient. The elements that were seated in reality worked well and made sense but the ridiculous departures were downright dumb and confusing.This iteration of Riddler had potential but ending up falling flat. A lot of the strengths in the art that were in Volume 1 are in this book as well such as the detail, dark, gritty tone, giving a realistic touch worked. That realism hurt the over-the-top touches of the story and art though. Sometimes having a phenomenal number one isn't the greatest thing because it makes the landing that much harder to stick. In this case and from my point of view not only did they not stick the landing but they stumbled and fell too. I would be interested to read a third volume because of some of the cool things that didn't come to fruition in this book that were setup but I wouldn't waste $25 on Batman Earth One Volume 2 again if I didn't have to. Because of all of this I unfortunately have to give it a Skim.